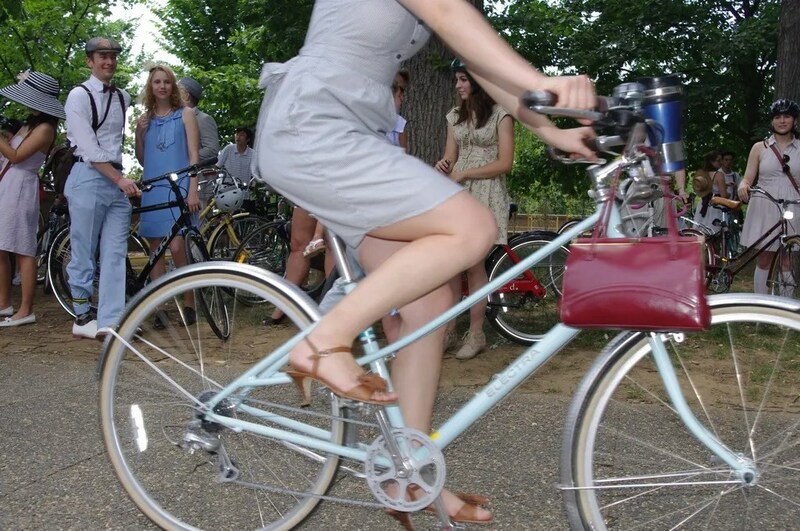 There was so much fashion and bicycle eye candy at the Seersucker Social it needed its own post. The best thing (IMHO) about the social was the sheer diversity of participants. There were people of every ethnic origin there and we were all just in to it. Plus, I talked to so many people and had just a brilliant time. There’s a tweed ride in the fall and I’m already trying to sort out what I’ll be wearing. Plus, I’m lucky DC is just an hour away. Above is one of the organizers. Don’t you love the little hatbox in her basket? This woman has a folding bike. 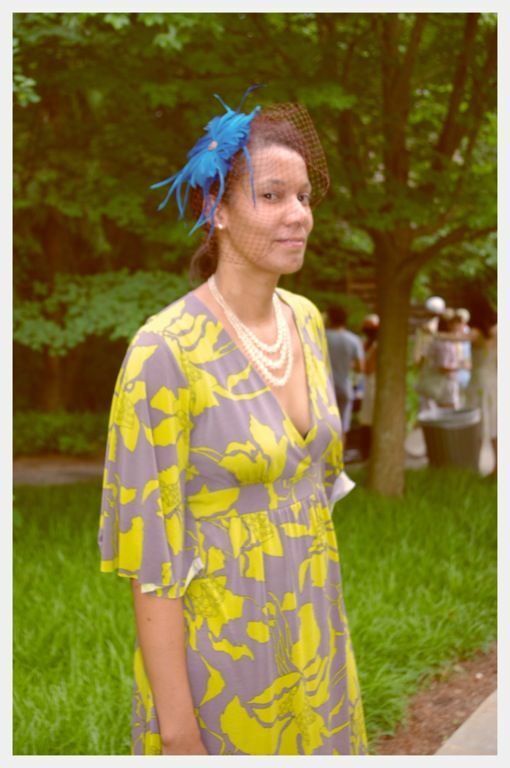 Fascinators were *huge* at the Seersucker Social. I liked his checked jacket and how her necklace stands out against her dress. So, I think they were more ‘tweed’ than ‘seersucker’. But, when I pulled out the camera they gave great face. 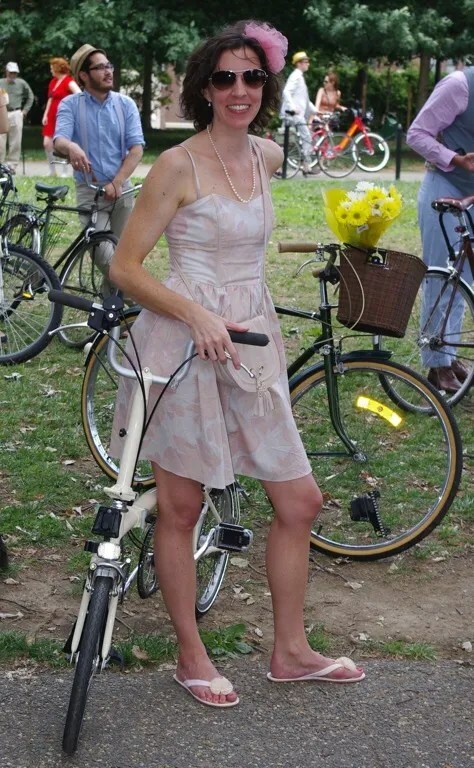 I biked in heels too! 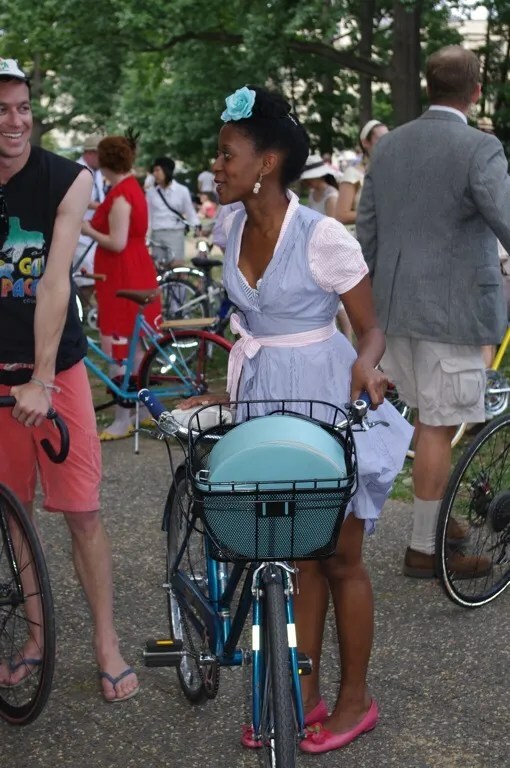 I didn’t think you could bike with a pencil skirt. But, apparently you can. 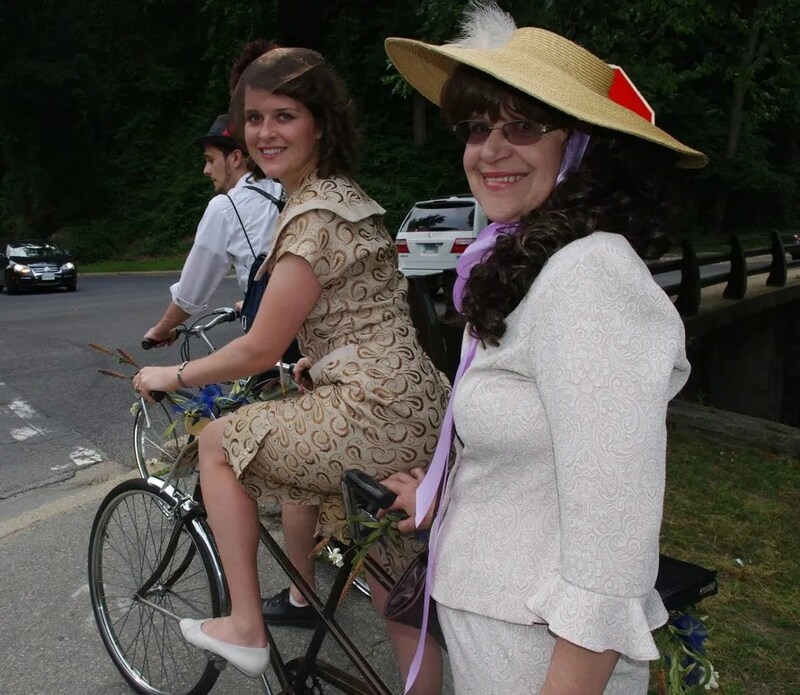 This mother – daughter duo was on a tandem. I thought they were darling! Yeah. I was just flirting with him. Until I figured out her was a good eight years younger. I’m not in my cougar years yet. But, do love the red and white combo. 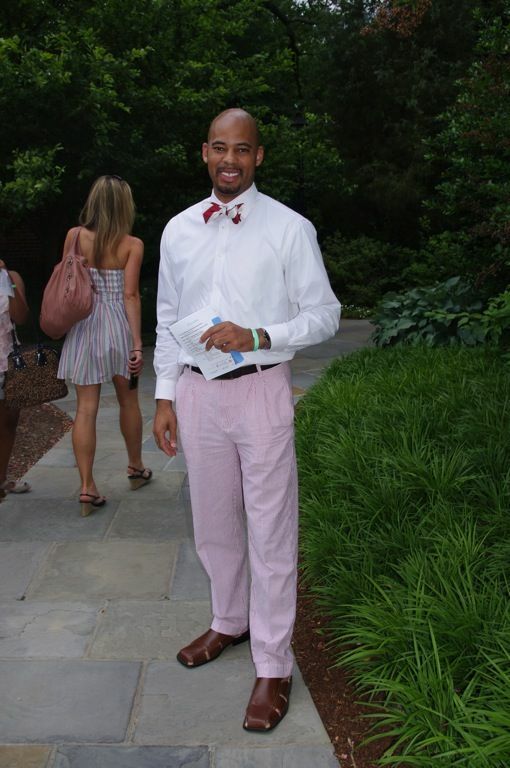 Needless to say, he’s a Kappa (a fraternity whose colors are red and white). I started talking to this guy at the beginning of the ride. 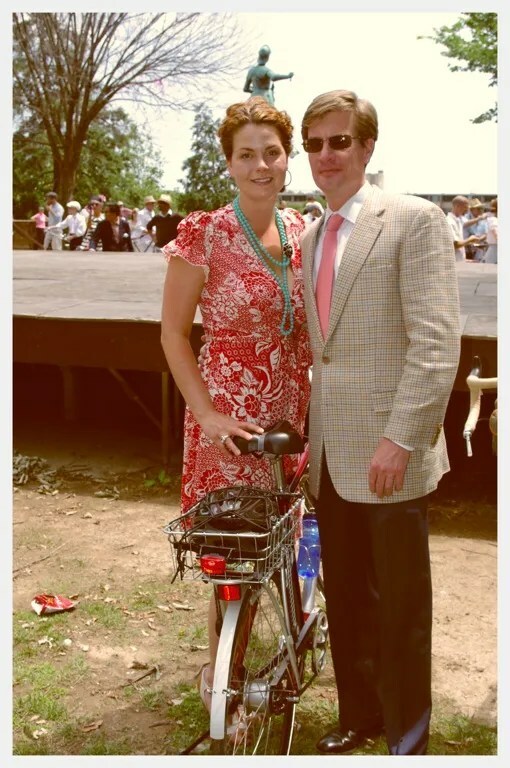 He just moved to DC from London last week and heard about the ride when buying his bike. So, he came on his own. Love both of these women. 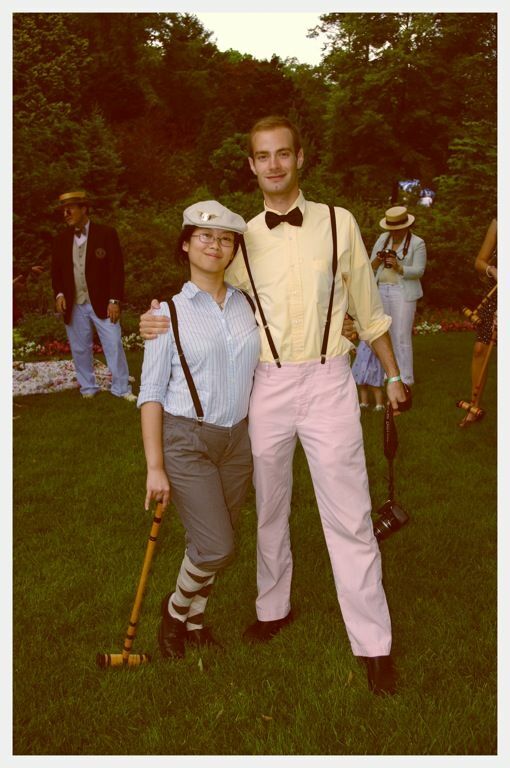 There were croquet games going through the time. 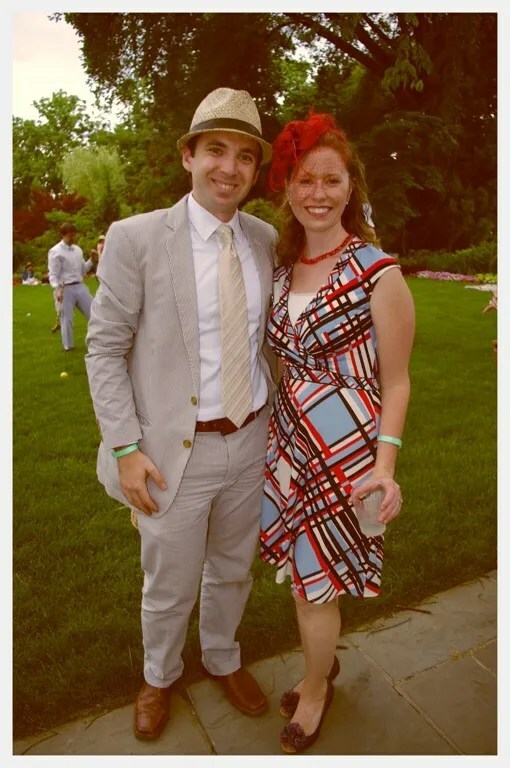 I spied this couple and loved the matching theme. Remember this dress?? It’s the first time I’ve actually seen it in person. I was tempted to take it from her. You absolutely didn’t have to do vintage to fit in. I adored the colors on the left and the 40s feel on the right. I’ll have to consider serious retro next time. 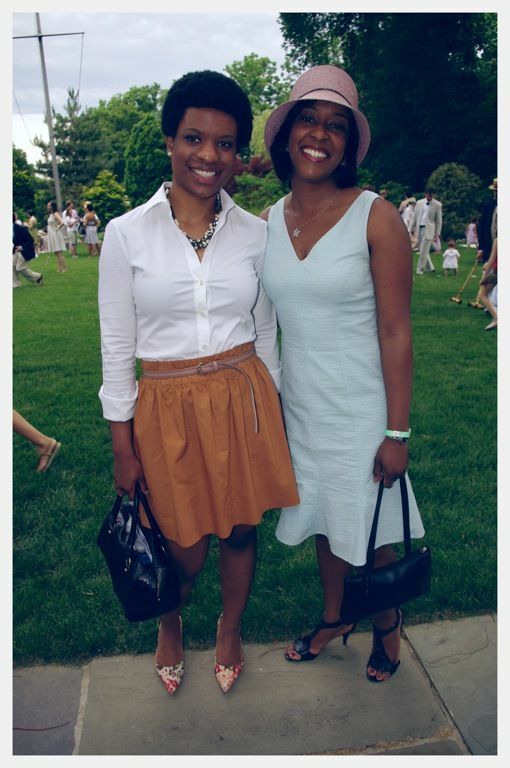 This is Amber on the left. She’s a blog reader! She made bother her dress and her friends. In like three days. Look at that. Shorts on men that are actually shorts. Can we also discuss what a clean cool look these are? Love the blue with her dress. 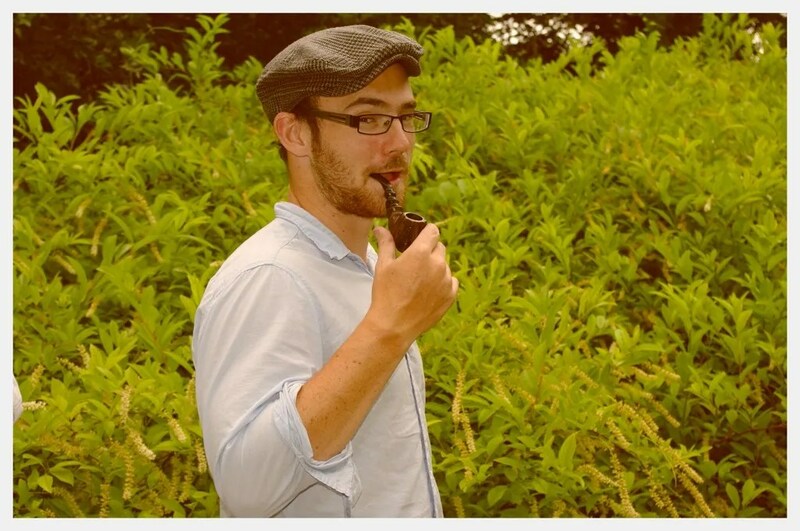 And, it wouldn’t be a vintage theme garden party without a pipe. Previous Post It All Came Together. Sort Of. Great visual study! There was all kinds of stylin’, for sure! Were there no seniors riding or is your camera too young? None that I saw. I was definitely at the upper age group limit. Likely because this was very social media driven. What fun! Thanks for the virtual tour. 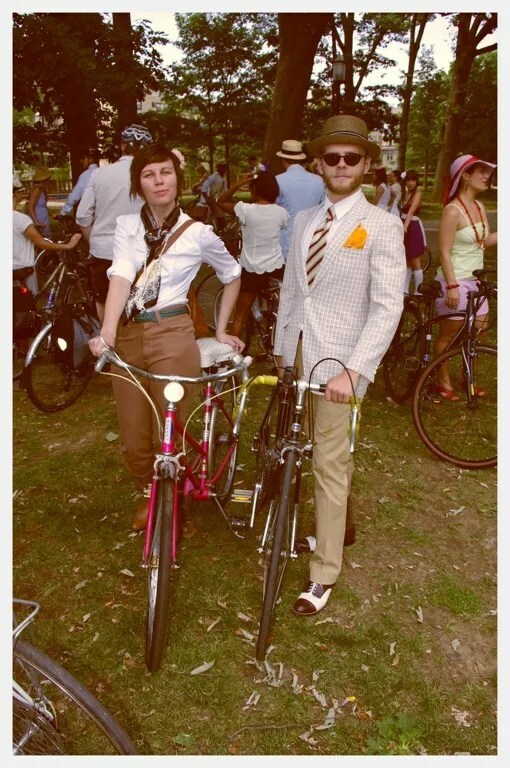 You do need to go retro – start now for the tweed ride! And ~ Way to go, Amber!!!! What a kewl event. Thanks for sharing it with us! You can indeed bike in a pencil skirt. The only problem comes if you’re trying to get on or off the bike quickly. But think of the good part: it’s harder for the skirt to end up way over your head :-). Loved all the pictures from the social. It looks like it was a total blast. I think you should ask that young Kappa out! It is all just fabuloso! btw, your camera work is just great! I imagine a ‘coffee table book’ ! also, with regard to your ruffled blouse seersucker. Way cool!! you can finetune it, w/o much trouble. Your skills are amazing!! How very cool! I wish there was something like that where I live (or that I had the energy to organise one myself!). I’m glad you had a blast and that you had a cute new outfit to wear. And if the only check against that handsome fellow is his age, well eight years isn’t *that* big a difference. And for simple flirting he’s definitely in horseshoe range. I love the photo’s, what a blast… I am so glad you are sharing!!! I think you should just hit all the cool events like this on the East Coast. 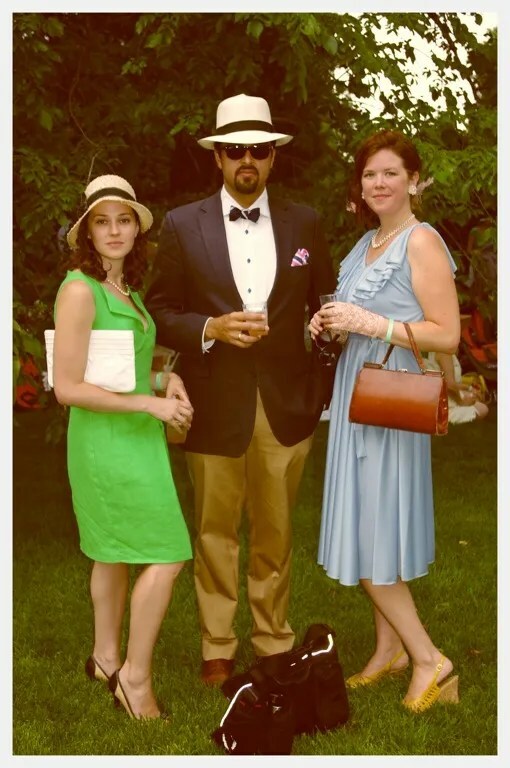 Like I think NYC has a twenties-themed outdoor thing in the summer. It looks like it was too much fun. Thanks for the pix. I loved both of your posts about the social. I had to laugh out loud at the Goodwill part. But oh, but those tiny man shorts. I just can’t get behind that. 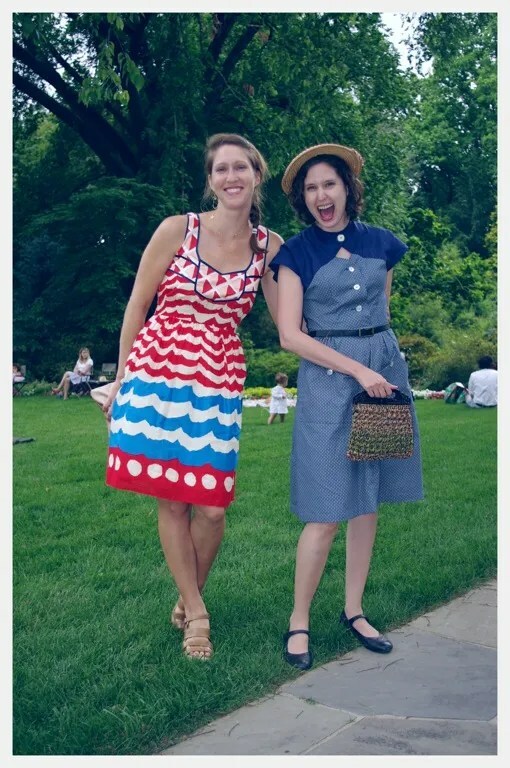 Loads of great style – where do I start? The lady in the first shot is so cute and the hatbox just makes her cuter. The boy in red and white? Flirt away. 8 years is nothing! 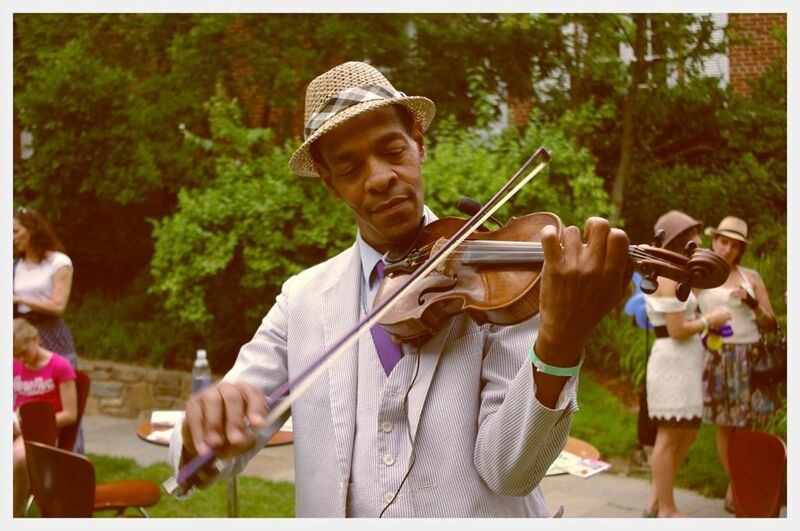 The fellow playing the violin is kinda handsome, too! 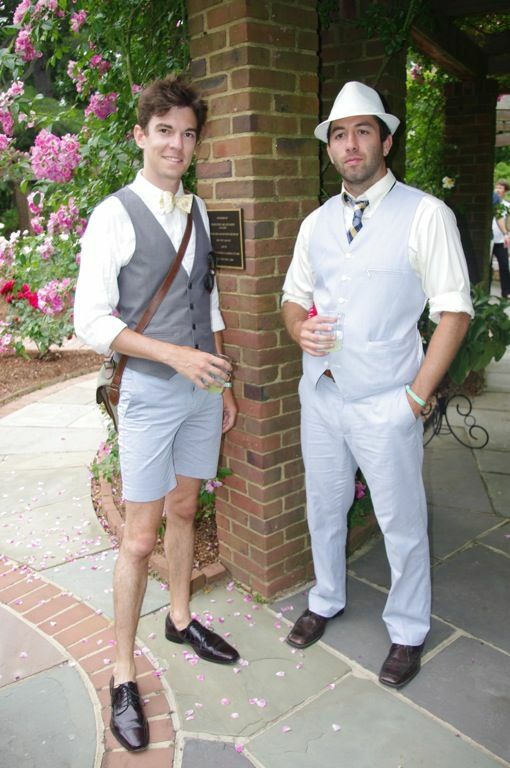 I love the boy in shorts and bow tie. It’s a great look. Amber’s hat is incredible – I want it. You know what, I think I’m just going to move there so I can come next year. It looks like a load of fun. Great photos. Thanks for posting them. It looked like a lot of fun. 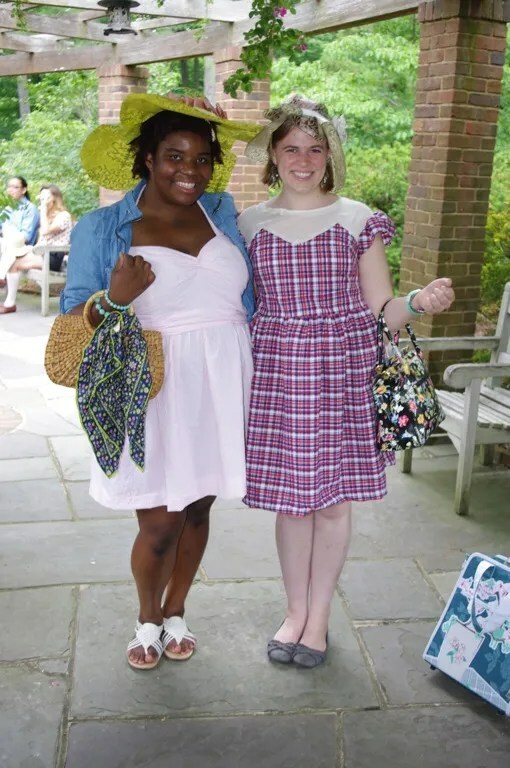 The vintage fashions are great.